It is common for households to have oral or rectal glass mercury thermometers in their medicine cabinets. When safely encased in thermometers, elemental mercury, a silver colored metal known to be toxic to humans, is not a threat. However, when mishandled, broken glass thermometers can become an important source of mercury in the home. Some other potential sources of household mercury are sphygmomanometers (blood pressure cuffs), cooking thermometers, fluorescent bulbs, mercury switches in children’s light up sneakers, and home heating system thermostats. Fortunately, technological improvements have led to the replacement of the mercury in many of the above devices with electrical components. Thermostats and switches contain several grams of mercury in fragile glass bulbs or ampoules. These ampoules (as well as mercury containing thermometers) may break, releasing droplets of toxic mercury. It is especially important to protect young children and pregnant women from the toxic effects of mercury. The two primary routes of exposure which pose the greatest personal risk are direct contact with skin and breathing in mercury vapors. Fetuses can be exposed because mercury can pass through the placenta. However, cleaning up a small mercury spill (less than ½ teaspoon) should not become a "crisis" for the homeowner. A careful and prompt cleanup of the spill by the homeowner will minimize exposure to the home’s occupants and to the environment. Mercury is toxic to the human nervous system, as well as fish and animals. Mercury can enter the body either through skin absorption or through inhalation of mercury vapors. At room temperature, small beads of mercury will vaporize. This FAQ page provides only recommendations for homeowners to follow; following these steps does not guarantee that all of the mercury will be removed from a spill area. You should contact a private hazardous waste vendor (listed in the Yellow Pages) for professional mercury spill cleanup services. Household Hazardous Waste Exemption - This means that there are no regulations governing how households must clean up or dispose of mercury contaminated wastes resulting from broken mercury containing devices. Even so, it is not recommended that any mercury wastes be disposed of with ordinary trash. 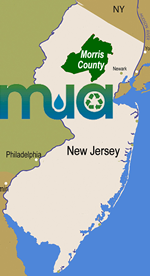 Morris County has a household hazardous waste facility located in Mount Olive Township that is open by appointment on most Tuesday, Friday and Saturday mornings. Please call 973-829-8006 to schedule an appointment. Do not use a household vacuum cleaner to pick up the mercury and mercury-contaminated items. The mercury has a greater chance to volatilize and become airborne by way of the vacuum’s exhaust. The vacuum cleaner will become contaminated and disposal of the vacuum may be necessary. Do not wash mercury-contaminated clothing, rugs or other fabrics in the washing machine. The washing machine and wastewater may become contaminated. Do not use a broom to sweep up the mercury. It can break the mercury into smaller beads, spreading them. Do not pour mercury down the drain. You may contaminate your plumbing, septic system or your local sewage treatment plant. Do not spread mercury that has gotten onto your shoes. If possible, clean the shoes. If not, wrap them in a plastic bag and dispose of them as indicated below. zinc flakes or copper flakes (available at hardware stores). Commercial mercury spill cleanup kits are normally available from medical supply and environmental safety supply companies, but may take time to obtain unless ordered prior to a spill. When using a spill cleanup kit, follow the directions which come with it. Powdered sulfur can also be used to coat mercury. The sulfur keeps the mercury from volatilizing. Powdered sulfur may be purchased at garden supply houses or pharmacies. Please note that powdered sulfur may stain fabrics a dark color. Determine the limits of the mercury-contaminated area(s). Avoid walking through a mercury-contaminated area(s) so as to avoid contaminating other areas of your home. Before beginning any spill clean-up make sure that the area is adequately ventilated or you have a respirator with mercury vapor cartridges. Carefully pick up any broken pieces of glass (NEVER SWEEP OR VACUUM MERCURY). Place them on a paper towel or tissue. Wrap or fold the paper towel, and place it into a leak-tight plastic bag or sealable plastic container. The eyedropper is used to draw up the mercury beads. Hold the eyedropper almost parallel with the floor. Pay close attention to any cracks in the area of the spill. The mercury drawn up into the dropper can then be gently squeezed onto a damp paper towel or directly into the container. If an eyedropper is not available, consider using a sheet of paper, and gently move the mercury onto the paper. Sprinkle sulfur powder on the spill area to control mercury vapors. Then, working from the outside of the spill area toward the center, push small mercury beads together with a card, stiff paper, or squeegee to form larger droplets. Put droplets into a leak-tight plastic bag or plastic container. Use the sticky side of a two-inch (or wider) duct or masking tape to pick up any remaining glass or mercury beads. Pay special attention to cracks and crevices. Place tape and debris in a leak-tight plastic bag or sealable plastic container. Use a flashlight to look all around the spill area. The mercury beads will reflect best when the flashlight beam is directed at an angle. Again sprinkle sulfur powder on the spill area after cleaning up beads of mercury; a color change from yellow to brown indicates that mercury is still present and more cleanup is needed. Sprinkle zinc flakes or copper flakes (available at hardware stores) to amalgamate any small amounts of mercury which remain. Let the area air dry, and, when possible, thoroughly vent the spill area to the outside air. A fan placed in a window or doorway may be used to increase the air flow out of the house. This may need to be repeated over several days to decrease the concentration of mercury that has become airborne. When finished, carefully remove latex gloves and place them in a leak-tight plastic bag or sealable plastic container. Do not touch the glove fingertips or parts that may have come in contact with mercury. Place all the closed containers in a double plastic bag and tie the opening. Dispose of any contaminated cloths, fabric or footwear by placing them in a plastic bag for disposal. Seal all containers at this time. Store the containers in a safe place, away from children while awaiting disposal. Properly dispose through a hazardous waste transporter, mercury recycler or call your local solid waste office. Thoroughly clean your hands and body. Never wash contaminated clothing in a washing machine or remove contaminated clothing or apparel from a spill site. This will help prevent further site contamination. These should be disposed of as hazardous waste. If the mercury is spilled on a wall-to-wall rug, use a sharp knife to cut out the mercury-contaminated section of carpet from the uncontaminated carpet. For small rugs and other pieces of fabric, fold or roll the surface so that the mercury-contaminated area is trapped inside of it. Place the mercury-contaminated material into plastic garbage bags. Refer to the steps outlined in "Typical Cleanup Procedure for Small Mercury Spills on smooth, Hard Surfaces" starting at Step 11, or earlier as necessary. Immediately evacuate everyone from the room and close the doors. Turn off central heating or cooling system. Call DEP at 1-877-WARNDEP to report the spill. Notify local health department and ask if they have a mercury spill kit. Otherwise, get names of professional clean-up firms.